Apartments "Ana" and "Marina" are located in a newly built luxury house in the Varvari settlement. Apartment "Ana" is located on the ground floor, while the "Marina" apartment is on the first floor. Although the apartments are located in the immediate vicinity of Poreč, they offer an oasis of peace and relaxation with their position. The excellent position of the apartments "Ana" and "Marina" offer a wealth of attractive locations and valuable sightseeing sites. 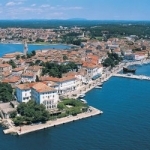 Only 3 km away is the old town center of Poreč, attractive beaches, luxury restaurants, wine bars, coffee bars and nightclubs. Within the apartments "Ana" and "Marina" there is a spacious yard with an outdoor fireplace that allows you to enjoy the barbecue. Also within the yard there is free parking and a garden sitting set for morning coffee and an afternoon cold drink. Both apartments are equipped with Wi-Fi signal, air conditioning, washing machine, iron, hair dryer, toasters, water heaters, and all other necessary appliances for a comfortable stay. Payment is made on the day of arrival, and at the time of the agreement is paid on the advance payment of 15% of the total amount of accommodation. Such an advance provides the guest with accommodation security. In case of cancellation of the reservation the advance is non-refundable. Ideal arrival time is 15h and departure time up to 10h. When handing over the keys, the lessee takes 50 € as an insurance against possible damages. If before the departure of the guest is found the condition as stated, the insurance will be returned, otherwise the lessee will retain 50 € as compensation for the damage. In addition to the rental price, a bottle of Istrian wine of local winemakers with a bowl of fruit and a cooled bottle of mineral and non-polluted water is included in the price. Apartments Ana & Marina listing has been viewed 1684 times since 05.02.2019.